Welcome to the Girardian Virtual Bible Study! Each week we explore the lectionary passage with the help of René Girard’s insights into human relationships. We hope you enjoy this installment of the GVBS. Join us next week at 10 am Central on the Raven Foundation Facebook page for the live show. The show notes and video recording are below. This week’s episode explores Lent 5, Year C, Isaiah 43:16-21 and John 12:1-11. It’s Lindsey’s birthday! Happy birthday, Lindsey! Lindsey will celebrate by spending quality time with her family. Adam will celebrate Lindsey’s birthday by getting the second phase of his tattoo tomorrow! Yay! This passage is from Second Isaiah, which was written during the Babylonian Exile. The Babylonians destroyed Jerusalem – including the Temple – and sent many of Isaiah’s people throughout the Babylonian Empire. Isaiah’s message of hope was for those in exile. So far, Second Isaiah follows a familiar pattern. During times of tragedy, he reminds the people that their ancestors went through tragic times in the past and God was there to deliver them. To paraphrase Isaiah, “Hey guys, remember what God has done for us in the past. God’s going to do that again!” The point is that God will deliver us too, just like God delivered out ancestors. At this point, I’d like for God just to do the old thing. But here’s the point: The old thing involved killing the Egyptian army – extinguishing them in the Red Sea like a wick. The old thing is a pattern of divine violence against our enemies so that we may live. What’s the new thing? The point is that wild animals, like jackals and ostriches, were unclean. And yet even they are God’s creatures. Even those animals who are labeled by our religion as “other” belong to God’s love. Indeed, God is doing a new thing, do you not perceive it? If you take Isaiah’s poetry too literally, you will not perceive it. For the unclean animals are a metaphor for people. Who are the violent and unclean jackals? The Babylonians who have just devoured our city and our people. But shouldn’t God drown those jackal-like Babylonians in the sea, just like God did to the Egyptians? Isn’t that how this works? Our enemies have to die so that we may live, right? Christians often think that Jesus’ call to love our enemies is a radically new teaching. And it is! It is new and radical to every generation. But the early church understood that Isaiah, especially what we call Second Isaiah, was a prefiguration of Christ. Christ was formed by Second Isaiah, and this passage is perfectly in line with the new thing Jesus did and taught. God is doing something new, huh? Isaiah understood it. And so did Mary. Jesus is at a party at Lazarus’s house. Lazarus was dead, but Jesus raised him back to life. This resurrection thing more than a cool party trick. It upends the old human pattern of death to others so that we may live. Our enemies must be killed so that we can have peace, security, life abundant. Jesus raised Lazarus from the dead, which should be a cause for celebration! But in verses 9-11, we find that the chief priests want to kill Lazarus. Why? Because many were beginning to believe in Jesus. But it wasn’t just Jesus they believed in. They began to believe in the new thing God was doing through Jesus. This new thing was actually a very old thing – first seen prophets like Isaiah – but this old thing was lived out in the life, death, and resurrection of Jesus. Interestingly, Mary was the first disciple to understand this. Mary was a disciple because she sat at Jesus’ feet, something only disciples did. She understood Jesus’ mission long before the male disciples understood his mission. Mary anointed Jesus’ feet, an act of love and devotion to her great teacher. It was also a deliberate act that was associated with Jesus’ death. Mary knew Jesus was the Messiah who would not save his people by killing their enemies. That would be the old way of doing things. Jesus was fully caught up in God’s new way of life – the divine life that has nothing to do with killing others, but everything to do with nonviolent, self-sacrificial love. For this pattern is the true way to eternal life. Judas, on the other hand, was a jackal. He criticized Mary and said the anointing oil could have been much better used by selling it and giving the proceeds to the poor. The Gospel of John puts Judas in the worst light, telling us that he didn’t care about the poor, but wanted to steal the proceeds and keep them for himself. Jesus says, “Leave her alone.” Judas wanted to blame Mary for wasting expensive anointing oil on Jesus, but Jesus stopped him in his tracks. Like Jesus, sometimes we have to stop the jackals. Sometimes we have to tell people to stop blaming others. Sometimes we have to stop scapegoating in its tracks. But we also have to remember that even the jackals belong to God. Which is good news for us all, because there are times when we all have been like a jackal. For just as Mary anointed Jesus feet, so Jesus washed the feet of his 12 original disciples. By the next chapter, Jesus knows he is going to be killed and that he will be betrayed by his disciples. And yet he washes their feet. All of them. 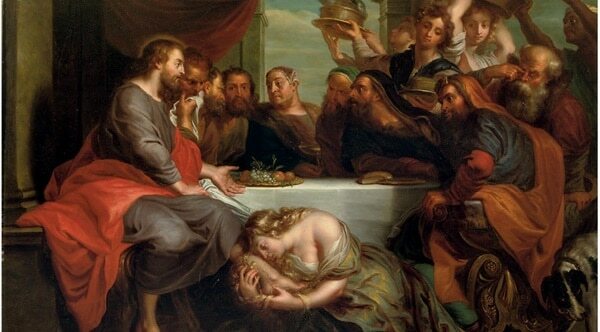 Even Judas, that biggest jackal of them all, is loved by Jesus. Judas belongs to the love of Christ. Even Peter, who insists that he should be like Mary and wash Jesus’ feet, even Peter who isn’t quite like Mary yet because even he will abandon Jesus, even Peter receives this act of love and service from Jesus. That’s one connection between these passages from Isaiah and John. Don’t we all at one time or another behave like jackals? Don’t we all fall into the old pattern of betraying one another – of thinking that another has to die in order for us to have peace, security, and life? Isaiah and Jesus both reveal that God is doing something new to change our old patterns from violence to nonviolence, from death to life. Do you perceive it?